(She was not found in the regular census schedule in Jasper Co.). Sarah is noted as one of two females under 10 years of age in the 1820 census of Abbeville District, SC. Since this is where her father was raised and where he was still living, it is believed to have been Sarah's place of birth. By 1830, Sarah's father had moved his family to Pike Co., GA where Sarah was noted as one of three females 10-15 year old in the household of her father. Sarah would have been 40 years 4 months and 8 days old at her death. Mrs. G. R. (Margaret Culpepper) Trimble, the youngest daughter of Lewis P. Culpepper and his second wife, wrote about Sarah in a 17 Dec 1949 letter to Sarah's great-granddaughter, Mary Erom Griffin: "Father said they [Lewis and Sarah] were fourth cousins." Joseph Richard Culpepper, the oldest son of Rev. Lewis P. Culpepper and his first wife, Sarah, wrote circa 1910-1915 to a cousin, Rev. George B. Culpepper, saying that he "wrote to Father [Lewis Peek Culpepper] asking him to give me all the information he could relative to his father, grandfather, etc.... He [Lewis Peek Culpepper] says there were three brothers, John, Ben and Joseph. John was my great grandfather as was Joseph, also, on my mother's side...." If this information is correct and Lewis Peek's grandfather, John, was the brother of Sarah Ann Culpepper's grandfather, Joseph, then Lewis and Sarah were in fact second cousins. Vol 1 p 505 13 May 1858 issue; POB based on father's census. Lewis Peek Culpepper recorded his second wife's name and date of birth in his Bible: "Margret B. Born June 24, 1833." 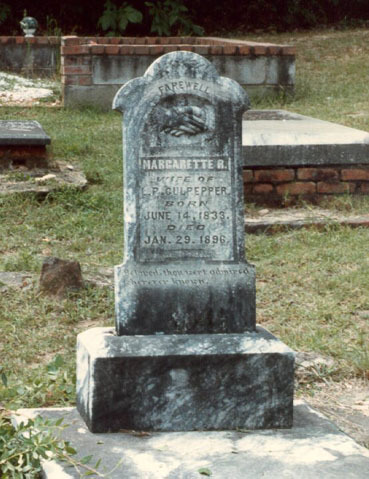 Her name and date of birth and death were recorded on p. 153 of A Survey of Cemeteries in Chambers County, Alabama from her tombstone in the State Line Congregational Christian Church Cemetery (Township 24 N, Range 28 E) as: "Margarette R. Culpepper June 14, 1833/Jan. 29 1896." Presumably this information also came from Lewis P. Culpepper. A granddaughter, Mrs. J. H. (Margaret Phillips) Dodd wrote in a 12 April 1979 letter: From what I remember being told by my mother, grandmother's name was Margaret Joyce and aunt Maggie [Mrs. G. R. (Maggie Culpepper) Trimble] was Margaret Joyce for her mother and I became Margaret Joyce for aunt Maggie. Lewis P. Culpepper also recorded his second marriage in his Bible: "Lewis P. Culpepper... Married the Second time to Margrett R. Bateman Dec the 2nd 1858." Mrs. S. B. (Mary Exa Culpepper) Crossman wrote in a 24 Sep 1978 letter: Hattie [Culpepper Smith] did tell me that grandmother [Margaret Bateman Culpepper] was such a good housekeeper that every time they visited her, she (Hattie) was scared to death she would do something wrong. Mrs. J. H. (Margaret Phillips) Dodd wrote in a 21 Aug 1978 letter: Mother [Mrs. J. H. (Julia Culpepper) Phillips] said grandmother [Mrs. L. P. (Margarette Bateman) Culpepper] was a midwife. She [Margarette] told mother [Julia] that Aunt Polly [a sister of Margarette Bateman?] (that's all she [Julia] knew about Aunt Polly) taught her [Margarette] how to deliver babies and to gather herbs from the woods to make medicine. Mother remembers going with her [Margarette] to gather herbs. Mrs. Dodd continued in a 8 Oct 78 letter: I don't remember mother [Mrs. J. H. (Julia Culpepper) Phillips] talking about grandmother [Mrs. L. P. (Margarette Bateman) Culpepper] treating any of the children with herbal medicines, however I'm sure she did when they were sick. She [Julia] talked mostly about grandmother having her own horse and visiting sick people. She said that sometimes grandmother [Mrs. L. P. (Margarette Bateman) Culpepper] would spend several days with a person who was ill.
P 811 (Margaret J., 26, in hh of Lewis Culpepper.